The artist Aija Zariņa’s solo exhibition “Conversation about Art in Riga” is on view at the 2nd floor of the Riga Gallery from January 12 to January 24, 2004. The exhibition includes paintings and a film on conversation about art in Riga – the artist took interviews from the Minister of Culture Inguna Rībena, Director of the Culture Capital Foundation Edgars Vērpe, Head of the Strategy Department at the Ministry of Culture Jolanta Treile, art historians Eduards Kļaviņš and Stella Pelše. The artist has attempted to clear up what is the role of art in society’s development and who might be responsible for this. “During my lasting activities in the field of art I has often realised my carrier and business interests in the name of art. I have been standing behind the back of Art and realising my craft-like and philosophical ideas. I do not want to use the name of art any more in that superficial sense. As the new age has started, I have understood that Art is the only agent capable of creating new ways of understanding and thinking. This could be named the new ideology as well. The government, lead either by the Prime Minister Einārs Repše or by somebody else, should secure fair economic activity, and art in its turn should secure the way towards highly developed society. This film is a conversation with officials of the art field about their role and responsibility.” Aija Zariņa. Aija Zariņa was born in 1954. She graduated from the Latvian Academy of Art, Department of Painting, in 1982, and received master’s degree as well. She is the member of the Artists’ Union of Latvia since 1983. Important solo exhibitions – “Guide” at the Gallery Noass in Riga (1999), “Aija is Drawing. 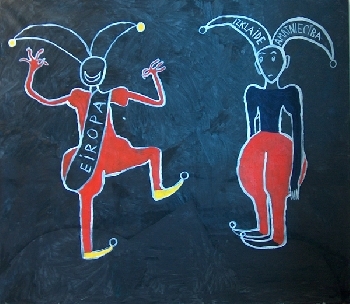 Aija in a Symbol” at the State Museum of Art in Riga (1998), “Head of the Virgin Mary” at the Riga Gallery (1996), series of exhibitions “Centaur, Bird and Elephant” in Riga, exhibition at the Galerie du Rond Point in Paris (1992), exhibition at the Eduard Nakhamkin’s Fine Arts Gallery in New York (1989). Important group exhibitions – “Gentle Fluctuations” at the State Museum of Art Exhibition Hall Arsenāls (2002) and at the Exhibition Hall Latvija (1990) in Riga, “House in Bolderāja” in Bolderāja, Riga (1997), “Personal Time. Art of Estonia, Latvia and Lithuania: 1945-1996” at the Contemporary Art Centre Zamek Ujazdowski in Warsaw, Poland, and at the Central Exhibition Hall Manezh in St. Petersburg, Russia (1996), “Riga – Lettische Avantgarde” at Kunsthalle in Berlin, at the Exhibition Hall Weseburg in Bremen and at the Municipal Gallery Im Sophienhof in Kiel, Germany (1988, 1989). Aija Zariņa has worked at the Public Relations Department of the State Museum of Art and curated the exhibition “Antiņš” at the State Museum of Art Exhibition Hall Arsenāls in 2001.